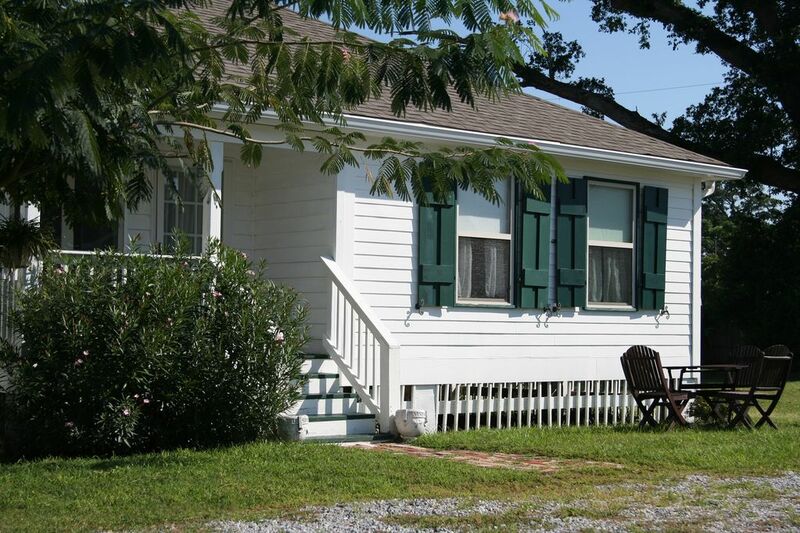 Overlooking the historic Pass Christian Yacht Harbor (only one of three 19th century resort harbors with Cape May and Newport being the other two) and Gulf of Mexico, this adorable Acadian cottage offers all the amenities one expects of Southern hospitality and charm. The cottage has three large bedrooms, two baths, a very large living room and kitchen plus a utility room with washer and dryer. The back yard is picket fenced and ready for your pet. Sitting on the front porch at sunset watching the boats come in the harbor melts away all tensions of the day. The sugar white beaches stretch twenty six miles. A boat launch is across the street with trailer storage on the property. Fresh fish, oysters, crab and shrimp are for sale at the harbor on a daily basis. Charter boat fishing or fishing from the harbor gazebos (across the street) avail those interested in sport fishing. Being in the heart of the Historic District, restaurants abound within walking distance as well as antique shops and boutiques. Historic mansions and centuries old live oak trees line Scenic Drive. Las Vegas style casinos are minutes away in Gulfport and Biloxi and New Orleans is just an hour away. For those golfers, there are 20 PGA courses on the Coast with three being in Pass Christian: a world class Arnie Palmer couse at The Bridges, The Oaks and Pass Christian Isle. Many wonderful events occur here on the Coast bringing in people from all over the country. The cottage is located on the Pass Christian Mardi Gras Parade route (the second largest Mardi Gras parade on the entire Gulf Coast) and we always have a huge buffet for friends and guests. St. Paul's seafood festival is in June and right down the street. Art in the Pass is a juried art show in April and Christmas in the Pass is a huge draw. But, best of all is 'Crusin the Coast'. At Harbor Oaks you have a front row seat watching the thousands of antique cars 'crusin' between Bay St. Louis and Biloxi, These are but a few of the many festivals on the Coast. Whether browsing the library four doors down, playing croquet in the front yard or taking your chances at the many casinos, you will find all the elements for a perfect and fun vacation at Harbour Oaks. We look forward to pampering you. Pets are accepted upon approval with a 75.00 non refundable pet deposit. Smoking is permitted outside only. Damage Deposits may be doubled for certain events. Everything was just as thet said it would be. Planning to come back next winter. Thank you for your kind review and we are pleased that we’ll see you next winter. By the way, the breakfast restaurant a few doors down just opened up. My current guests recommended it and said their specialty is Belgium waffles.....particularly the banana fosters waffles! Four of us had a very pleasant stay. Two good restaurants were within walking distance and the kitchen was well equipped for the meals we had at the house. Proximity to the beach is wonderful and we’d like to come back again. Harbour Oaks Cottage is just a gem! Harbour Oaks Cottage is just a gem! We found it on the internet, read the reviews and it was that and more. It is located just across Route 90 from the Harbour where fishing and pleasure boats come and go. Also, located over there is Shaggy's and Sea Level. Just 1/2 block away is Baccus on the Beach. These three restaurants are within easy walking distance. As you can tell, I like to eat. The cottage is very comfortable, nicely decorated and a wonderful place to spend a weekend, a week, or a month as we did. Thanks, Diane and Daughters for making our stay a great one! Excellent location, comfortable cottage with a pleasant and responsive owner. We loved our experience in Pass Christian and would love to return. The cottage was perfect. While it was just the two of us with our pups; the house has the space for more. We could see the harbor from the front porch and several good and fun restaurants within walking distance. The library was a short block away. We ventured in to New Orleans several times as it was an easy drive to and from. Diane was able to give us reliable references for where to eat and visit in the Mississippi Gulf Coast area. As you can see, we enjoyed our month in the ‘Pass’ and hope to be a regular return renters. I’m delighted you had a memorable vacation here in The Pass. This truly is a very special place. Thank you for your kind words. I’m just sorry I wasn’t able to meet you and visit more with you. I hope you come back soon. Our little town is starting to spurt up with more shops and restaurants each year. This time next year we should have Muriel’s (same as one in Jackson Square in New Orleans) to the west of Harbour Oaks. That will really be something. I absolutely loved the location. The cottage was stocked with everything we needed, especially the kitchen. It was unfortunate the wifi wasn't working, but it kept us off our devices! A nice quiet family place on the water with nearby shopping and great restaurants. Would visit again. As always, our stay was pleasant and relaxing. The location is perfect for walks or just to sit and relax on the porch viewing the harbor. Diane and Kathy are gracious hostesses who work to make the stay pleasant. Our dogs like those walks also!